Small pieces of space debris (usually parts of comets or asteroids) that are on a collision course with the Earth are called meteoroids. When meteoroids enter the Earth's atmosphere they are called meteors. Most meteors burn up in the atmosphere, but if they survive the frictional heating and strike the surface of the Earth they are called meteorites. The Earth has been struck by many meteorites, some quite large. The adjacent image shows the Barringer Crater in Arizona. It is 1.2 kilometers across and 200 meters deep, and was formed about 49,000 years ago by the impact of a 50 meter nickel/iron meteorite travelling at a speed of 11 kilometers per second. Most meteorites are much smaller and do much less damage, but as we shall see, in the geologically not so distant past the Earth has probably been struck by even larger meteorites than the one that formed the Barringer Crater. We have already discussed the Tunguska Event (which may have been a comet rather than an asteroid), and we shall discuss the high probability that the extinction of the dinosaurs was triggered by the impact of a massive meteorite in the Southern Caribbean region. Interplanetary space is littered with rocks tens of meters in diameter or less. When these meteoroids strike the Earth's atmosphere at high relative speeds they leave visible trails created when the intense heat caused by friction vaporizes them. These are called meteors ("shooting stars"). Most meteors are tiny specks of dust and rapidly burn up in the atmosphere. Some are larger and produce spectacular fireballs that are very bright, and may explode (in some cases with sound heard on the ground). Meteors are common; you can usually observe a few per hour on any clear night, but fireballs are rare. The following three images show some recently observed fireballs. The left image shows the path of a fireball recorded over Hannover, Germany. The fireball outshines Sirius and the constellation Orion . The middle image shows a fireball recorded in the 1996 Perseid meteor shower by the Dutch Meteor Society. The curved streaks are star tracks in the timed exposure. The pulsed nature of the fireball track is produced by the camera which is being chopped. The right image shows a fireball observed for over 20 seconds from Kentucky to New York in 1992 that led to a meteorite fall in Peekskill, New York. In this image the fireball is beginning to break up into smaller pieces. Here is a movie of the Peekskill fireball (972 kB; Source). Meteors enter our atmosphere on a regular basis. On a normal night you can typically see a few sporadic meteors per hour. However, at certain times the rate of observable meteors is much higher. These periods are called meteor showers. Further, during meteor showers (which usually last a few days), the majority of the meteors appear to come from a particular point in the sky, called the radiant of the shower. The adjacent figure illustrates the position of the radiant for the Leonid Meteor Shower, and here is a time-exposed image showing clearly the radiant location for the 1995 Lyrid Shower. The meteor shower is commonly named after the constellation in which this radiant is found, and occurs annually during a well-defined time period. For example, the Perseid meteor shower occurs every year from about July 25th through August 18th, with a peak on August 12, and has its radiant in the constellation Perseus. In this shower, the typical maximum number of meteors that can be seen per hour at its peak is about 70, which is 10 times the rate of sporadic meteors. Here is an observational determination of the radiant for the Quadrantid shower, and an MPEG movie (127 kB, compressed in time) showing 18 meteors of the Quandrantid shower. The movie was obtained from this paper, where a more detailed and technical discussion of photographing meteors and meteor showers may be found. The annual nature of meteor showers suggests that they are associated with the Earth encountering an unusually large number of meteoroids on particular parts of its orbit. As the following figures illustrate, meteor showers result when the Earth passes through the orbit of periodic comets. As comets move about their orbits they leave a stream of debris because dust and rocky material is liberated from the head as the ices vaporize. If the earth crosses the cometary orbit, this debris leads to an increased number of meteors (left figure). These periods are called meteor showers. That meteors in meteor showers appear to radiate from a single point in the sky is an optical illusion, as illustrated in the figure on the right. The meteor stream that produces the shower has meteoroids moving on essentially parallel trajectories, but because of perspective (parallel lines appear to meet at infinity) the meteors actually entering Earth's atmosphere on parallel trajectories seem to radiate from a point, as viewed from a site on Earth. Meteor showers often vary in intensity from year to year, presumably reflecting details of encountering the orbit of the parent comet. One shower that normally is rather weak, but can at times be strong is the Leonids. As the preceding table indicates, on the average it only gives 10 meteors per hour---not even twice the sporadic rate. However, there is a prediction that the Leonids will grow stronger for the next two years and in 1998 (or perhaps 1999) will produce 10,000 or more per hour at the peak (when the parent comet is near perihelion). According to some estimates the rate will be as high as 40 meteors per second (!) for a short period; a veritable meteor storm. Such predictions often do not pan out, but there is historical precedent for spectacular outbursts from the Leonids. On November 12-13, 1833, a "tempest of falling stars" was observed in Boston with a rate "half that of flakes of snow in an average snowstorm", while in the 1966 the Leonids produced "a hail of meteors too numerous to count" according to one observer and 150,000 per hour for a 20 minute period according to another. Newspaper accounts of the time reported that many people were awakened from sleep either by the shouts of neighbors, or the light of the meteors in the sky. The image on the right depicts a wood-cut engraving by Adolf Vollmy based upon an original painting by the Swiss artist Karl Jauslin, that is in turn based on a first-person account of the 1833 storm by a minister, Joseph Harvey Waggoner. According to Waggoner's account, "... it is not possible to give in a picture a representation of the stars falling at all points of the compass at once. But they fell in myriad's to the north, east, south and west. Any representation on paper must at best be a very limited idea of the reality" . Here is another artist's depiction of the view from Niagara Falls during the 1833 shower, and another account of the history of the Leonids. You are encouraged to follow these predictions of Leonid intensity as November, 1998, approaches. If they are true, it will be a spectacular sight---perhaps the greatest meteor display of the last 100 years. To help you keep track, here is the Leonid '98 Meteor Outburst Mission HomePage, a set of predictions for 1998 Leonid rates, and a history of Leonid showers. For good measure, here is the orbit and present position of the parent comet, P/Tempel-Tuttle. As an historical note, the 1833 Leonid shower in a certain sense marked the birth of the modern study of meteors, because attempts to explain the remarkable outburst eventually produced the realization that the Leonids are correlated with the periodic comet P/Tempel-Tuttle. This led to a general understanding of meteor showers as resulting from the Earth encountering the orbit of a periodic comet. These studies indicate that P/Tempel-Tuttle is in an unusual orbit for a comet, because it (1) comes close to the Earth's orbit, but (2) has a period sufficiently long that its orbit is only slightly perturbed by the planets. Comets with short periods that come close to the Earth typically do so only a time or two before gravitational interactions with the planets (primarily Jupiter) disturb them into other orbits. But P/Tempel-Tuttle's orbit has been relatively stable for many centuries and meteor storms have been seen for more than 1000 years that we now know are associated with this comet. Several hundred tons of meteoroids enter the Earth's atmosphere each day. Most of these are very small pieces (milligrams) that burn up quickly in the atmosphere and never reach the surface. 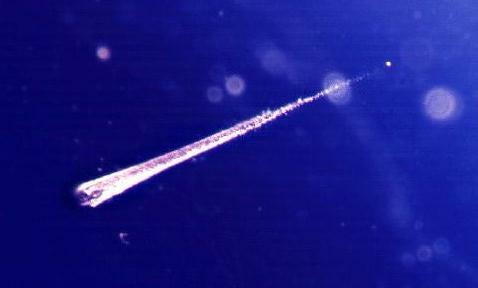 The following image shows a trail of a meteoroid captured in aerogel exposed to space by the EURECA spacecraft of the European Space Agency. The track of the meteoroid in this image is only about 0.05 inches long. The meteoroid itself has a diameter of only about 1/1000 of an inch and has come to rest just beyond the narrow end of the track in the upper right (the small white dot). Some of the larger and sturdier meteoroids survive the frictional heating and strike the Earth's surface; these we call meteorites. Most meteoritic material originates from pieces of asteroids; a smaller amount comes from comets. Thus, meteorites are important scientifically because they tell us about these primordial objects that we believe to be similar in composition to the material from which the Solar System formed. Here is a nice classification and introduction to meteorites, and here is a good introduction to meteorites by the Meteorite and Impacts Advisory Committee to the Canadian Space Agency. The following images show examples of three important classes of meteorites: a chondrite , an iron meteorite , and a carbonaceous chondrite. The stony meteorites (chondrites) are the most common, iron meteorites are composed largely of iron and nickel, and carbonaceous chondrites are of particular interest because they contain organic compounds and therefore may hold keys to how life developed in the Solar System. Because there are few other sources of rocky material on the Antarctic ice sheet, rocks found there are likely to be meteorites. This is in contrast to other areas where meteorites are mixed in with much larger numbers of normal rocks and may be difficult to identify as extraterrestrial. In certain places, the movement of the ice sheet tends to concentrate its accumulated load of meteorites at the surface. It is said that in some places one can walk across the ice sheet and almost always be in site of a rock, and be certain that the rock is a meteorite. Here is a more extensive discussion of Antarctic meteorites. A Meteorite from Mars with Evidence for Life? In some cases we believe that we have strong evidence for the exact source of particular meteorites because their detailed composition is too similar to the known composition of a parent body to be a coincidence. Most meteorites come from asteroids and comets, but there are a few that are thought to have originated on the Moon, and a few others that are thought to have come from Mars. Although this may seem surprising at first, it is not so much so when you consider the violent impacts that all objects in the Solar System have sufferered in the past. It is quite plausible that such impacts could have knocked parts of the Moon and Mars into orbits that would eventually insersect that of the Earth. The above left figure is of a 4.5 billion-year-old rock (meteorite ALH84001), that was discovered in Antartica and that is believed to have been dislodged from Mars by an impact about 16 million years ago and that fell to Earth 13,000 years ago. This meteorite is the center of a major controversy at present because it has been claimed (and disputed) that it contains fossil evidence that may indicate that primitive life existed on Mars more than 3.6 billion years ago. If true, this would be a major scientific discovery, but the jury is still out at the moment. A Piece of the Asteroid Vesta? The meteorite shown on the right was discovered in Western Australia in 1960. It is unique because it is made almost entirely of the mineral pyroxene, and its detailed composition and structure are different from any rock known for the Earth or the Moon. This composition suggests strongly that the origin of this meteorite is the 325-mile diameter asteroid Vesta, which has the same unique spectral signature for pyroxene. Other small asteroids observed near Vesta have the same pyroxene signature and are believed to be chips blasted of the surface of Vesta by collisions. This debris extends all the way to a Kirkwood gap that is swept free of asteroids by resonances with Jupiter's orbit. This resonance interaction removes material from the main asteroid belt and hurls it onto a new orbit that can cross Earth's orbit. It is speculated that this meteorite was torn off Vesta's surface as part of a larger fragment that broke apart in subsequent collisions, ended up in a Kirkwood gap, and was ejected by Jupiter's gravity onto a collision course toward Earth. Hubble Space Telescope observations reveal a giant impact basin on Vesta that may be evidence for the original collision that produced the meteorite. The Barringer Crater shown in the adjacent image is only the best-preserved of large meteor impacts. There is evidence for many more. Here is a link to some views of terrestrial impact craters, and here is a clickable map of terrestrial impact structure locations. Although in many instances these impact structures have been partially obliterated by erosion and tectonics, there is rather strong evidence that most are fossil impact craters. The average velocity of meteoroids entering our atmosphere is 10-70 km/second. The smaller ones that survive the trip to the Earth's surface are quickly slowed by atmospheric friction to speeds of a few hundred kilometers per hour, and so hit the Earth with no more speed than if they had been dropped from a tall building. For meteorites larger than a few hundred tons (which fortunately are quite rare), atmospheric friction has little effect on the velocity and they hit the Earth with the enormous speeds characteristic of their entry into our atmosphere. Thus, for example, it is estimated that the meteorite that produced the Barringer Crater was still travelling at 11 km/second when it struck what is now the Arizona desert 49,000 years ago. Such objects do enormous damage, because the kinetic energy carried by the meteorite is the product of the mass and the square of the velocity. There is no documented record of a human being killed by a meteorite, but in recent years meteorites have crashed into bedrooms in Alabama, dining rooms in Connecticut, and a car in New York. On October 9, 1992, a fireball was seen streaking across the sky from Kentucky to New York. At least 14 people captured part of the fireball on videotape; here is a spectacular MPEG movie (1 MB MPEG) of the fireball (source). A 12-kilogram stony meteorite (chondrite) from the fireball fell in Peekskill, New York, smashed the trunk of a parked automobile, and came to rest beneath it. These are the first motion picture recordings of a fireball with an associated meteorite fall. Here is a short MPEG movie of a -4 magnitude Delta Capricornid fireball (253 kB MPEG) recorded near Hannover, Germany, on January 5, 1995. Sixty-five million years ago, about 70 percent of all species then living on Earth disappeared within a very short period in what is termed the Cretaceous-Tertiary Mass Extinction---commonly known as the K-T Event (K is used to denote the Cretaceous period rather than C to avoid confusion with other periods such as the Cambrian). Among the species that disappeared were the last of the dinosaurs. The cause of this and other sudden species extinctions has long been an important and controversial topic. In 1980, physicist Luis Alvarez and coworkers reported finding a very high concentration of the element iridium in the sedimentary clay layer laid down at the time of the K-T extinction. On Earth, iridium is very rare in the crust because it was concentrated in Earth's core when it was largely molten. However, chondritic meteorites often still have the primordial solar system abundances of these elements. This led Alvarez et al to suggest that a chondritic asteroid 10 kilometers in diameter that struck the Earth in the K-T period would contain enough iridium to account for the worldwide clay layer iridium enhancement, and that this meteor impact could also have triggered dramatic climatic changes that produced the K-T extinction. The Crater Associated with the K-T Extinction? Since the original proposal, additional evidence has accumulated that strongly supports the impact theory. 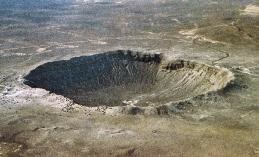 However, the theory remains contentious, and opponents had long argued that there was no evidence for the requisite crater associated with the impact. In 1990, it was realized that geophysical data taken 10 years earlier in a search for oil in the Yucatan region of Mexico indicated a 180-kilometer diameter ring structure centered on the present coastline and lying beneath several hundred meters of sedimentary deposits called Chicxulub that had the requisite characteristics. The Chicxulub structure has been age dated at 65 million years, and additional studies support its interpretation as a relic impact crater (here is a summary; here is a natural history museum exhibit concerning the event and recent ocean core sampling providing support for the K-T hypothesis). Although the original crater has been eroded and covered with sediment, models suggest that shortly after formation the Chicxulub crater may have resembled the crater Strindberg on Mercury. Thus, it has been proposed that 65 million years ago in what is now Yucatan the impact at a velocity of 11 km/second of a 10-kilometer wide asteroid threw huge amounts of matter into the atmosphere (in addition to local phenomena like generating 2000 foot waves that may have emptied the Gulf of Mexico!). This created months of darkness (interfering with photosynthesis) and much cooler temperatures globally, and the resulting harsh conditions led to the extinction of many species, including the last of the dinosaurs. Although this is a compelling hypothesis with substantial support, it remains controversial and has broad but not yet uniform acceptance within the scientific community. It is estimated that impacts of asteroids as large as the one thought responsible for the K-T extinction occur about once every hundred million years.